"Tom yum is perhaps the most famous of all Thai soups. It is a hot and sour soup flavored with fish sauce, shallots, lemon grass, kaffir lime leaves, galangal, tamarind and chillies. There are several variants of tom yum depending on the soup ingredients. The soup may be clear (without coconut) or with coconut milk (called tom yam num khon). 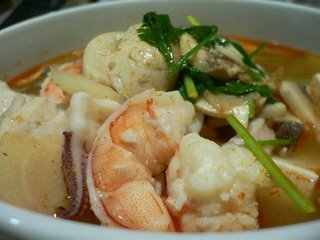 The most famous variety of tom yum is tom yam kung, where the main ingredients are shrimp and mushrooms, with shrimp fat added for taste and a milky look. Other varieties are also available, such as tom yam kai (chicken) and tom yam thale (seafood)". So here's my Tom Yam Thale. A mixture of prawns, fresh & button mushrooms, fish, sotong(squid), firm tofu & coriander as garnish. "Not the best that I've tasted b4, but still good",hubby said. haha! Snow Peas are hubby's favourite vegetable. I guess he likes them cuz they are crunchy. 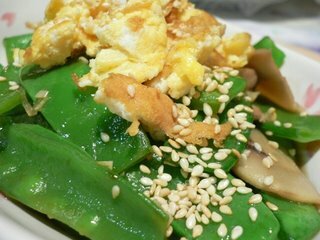 I added Fresh Mushrooms, Fried Eggs Strips & Toasted Sesame Seeds to further entice our appetite for the evening.